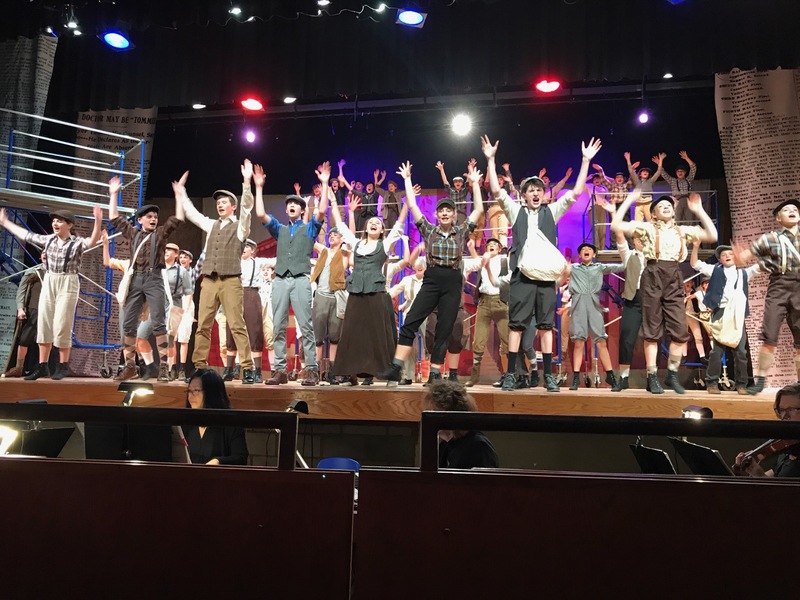 Once again the Knights Theater Company actors and crew have outdone themselves in their latest production – the Disney Musical, Newsies. This high energy ride is set in 1899 and features a rag tag group of kids trying to scrap out a living on the streets of New York as they fight for fair treatment from the financial Goliath of the day, Joseph Pulitzer. It also features sets and scenery that moves, amazing dancing and singing and incredible spirit and energy from a cast and crew of middle and high school students from STEM Academy and SHS! The Newsies ban together to strike. Met with the strong arm techniques of the day, they ban together to mobilize the city’s youth across neighborhoods and industries to bring the city to a halt and win the battle. The story of a big city boy dreaming of small town living is brought to life by Matt Jenkins. Matt does an amazing job as he balances a range of emotions and vocals to match. Whether leading the Newsies, challenging authority, dreaming of moving out west or as a romantic lead Matt develops his character through a complete emotional arc. One of the show’s most emotional moments comes thanks to Jameson Hart as Crutchie, the best friend of Jack, as he is held up in a New York City juvenile detention center after the Newsies suffer a loss. Jack’s song of loss and family inspires the Newsies to keep fighting. Davey (Alex Brennan) and his little brother Les (Luke MacDonald) pull the kids together to bring Jack back to lead the Newsies. Matt is supported by a high energy, dynamic cast. Characters like Race (Michael Polidor), Finch (Ashton Smart), Albert (Caleb Levesque), Buttons (Ray Milburn), Elmer (Marissa Peterson) and Brooklyn leader, Spot (Owen McDevitt) bring on the laughs. Supporting characters like Pulitzer’s team (led by Peter Harmon and Will Cummings) and the burlesque team led by Miss Medda (played by Evelyn Milburn) add depth to the storyline. The strong vocals of the army of Newsies and the dancing chops of the dance troupe (led by dance captains and sisters, Ashton and Brett Smart) bring songs like Carrying the Banner, Seize the Day and King of New York to life. This cast and this production are what makes the theater great. In the week leading up to the show, the flu made its way through the cast. Opening night gave no indication that the cast was struggling but on night two, the female lead performed flawlessly the night before by Lilly Anderson was down for the count. At the last minute, McKenna Lasit was asked to fill the spot without ever rehearsing the role before. In a true act of courage and in the spirit of the old Broadway adage, “the show must go on,” McKenna took the stage. Supported behind the scenes by cast members mouthing song lyrics and with the help of a script clutched in her hands, she stepped into the spotlight. At one point a song with a Sonheim-esque lyric pattern tripped up the ingenue and the audience showered her with love in the form of cheers. She jumped back into the song in an example of what makes live theater great. In the final moments of the show, in her character’s final scene with no lines left, her co-star and real life beau took the script from her grip and tossed it off stage as if to say, we got you; you did it! The audience roared with support! The story and this cast mirror each other in the way that great theater does. A show about how your friends become family and how teamwork brings out the best in us is what live theater is all about. Come experience it for yourself! Newsies will be performing later today (Sunday at 2pm) and again on Friday (April 5th) and Saturday (April 6th) at 7pm. It’s sure to be a new favorite! Trish Hill, Oak Ridge pincipal, performed in musicals at Carmel NY High School and at Fordham University. Her favorite production was “Sweeny Todd,” and she also played the lead role of Rose Alvarez in “Bye Bye Birdie.” Now she enjoys theater as a proud mom of 8th grader Maddie Baecker, a thriving member of Knights Theater Company. Clinking on one of the photos in the gallery will launch you into a great slide show of images! Find your favorite Newsie!